Legally, the city has less autonomy than the Provinces. In June 1996, shortly before the City's first Executive elections were held, the Argentine National Congress issued the National Law 24.588 (known as Ley Cafiero, after the Senator who advanced the projemacct) by which the authority over the 25,000-strong Argentine Federal Police and the responsibility over the federal institutions residing at the City (e.g., National Supreme Court of Justice buildings) would not be transferred from the National Government to the Autonomous City Government until a new consensus could be reached at the National Congress. Furthermore, it declared that the Port of Buenos Aires, along with some other places, would remain under constituted federal authorities. As of 2011, the deployment of the Metropolitan Police of Buenos Aires is ongoing. Beginning in 2007, the city has embarked on a new decentralization scheme, creating new Communes (comunas) which are to be managed by elected committees of seven members each. Buenos Aires is represented in the Argentine Senate by three senators (as of 2017, Federico Pinedo, Marta Varela and Pino Solanas). The people of Buenos Aires also elect 25 national deputies to the Argentine Chamber of Deputies. Templo Libertad is a Jewish house of prayer. Argentina's Jewish population is the largest in Latin America. Buenos Aires' inhabitants have been historically characterized as "fashion-conscious". National designers display their collections annually at the Buenos Aires Fashion Week (BAFWEEK) and related events. Inevitably being a season behind, it fails to receive much international attention. Nevertheless, the city remains an important regional fashion capital. According to Global Language Monitor, as of 2017 the city is the 20th leading fashion capital in the world, ranking second in Latin America after Rio de Janeiro. In 2005, Buenos Aires was appointed as the first UNESCO City of Design, and received this title once again in 2007. Since 2015, the Buenos Aires International Fashion Film Festival Buenos Aires (BAIFFF) takes place, sponsored by the city and Mercedes-Benz. The government of the city also organizes La Ciudad de Moda ("The City of Fashion"), an annual event that serves as a platform for emerging creators and attempts to boost the sector by providing management tools. In December 2010, the city government launched a bicycle sharing program with bicycles free for hire upon registration. Located in mostly central areas, there are 31 rental stations throughout the city providing over 850 bicycles to be picked up and dropped off at any station within an hour. As of 2013, the city has constructed 110 km (68.35 mi) of protected bicycle lanes and has plans to construct another 100 km (62.14 mi). In 2015, the stations were automated and the service became 24 hours through use of a smart card or mobile phone application. The Buenos Aires Underground (locally known as subte, from "subterráneo" meaning underground or subway), is a high-yield system providing access to various parts of the city. Opened in 1913, it is the oldest underground system in the Southern Hemisphere and oldest in the Spanish-speaking world. The system has six underground lines and one overground line, named by letters (A to E, and H) and there are 100 stations, and 58.8 km (37 mi) of route, including the Premetro line. An expansion program is underway to extend existing lines into the outer neighborhoods and add a new north-south line. Route length is expected to reach 89 km (55 mi) by 2011. Emerson, Charles. 1913: In Search of the World Before the Great War (2013) compares Buenos Aires to 20 major world cities; pp 252-66. The ATP Buenos Aires (Spanish: Abierto de Buenos Aires, pronounced [aˈβjeɾto ðe ˈβwenos ˈaiɾes]) originally known as the Argentine Championships and established in 1921 is an annual tennis event for male tennis players held in Buenos Aires, Argentina. The tournament is an ATP World Tour 250 series event on the ATP World Tour, and is played on outdoor clay courts at the 5,500 capacity Buenos Aires Lawn Tennis Club, in the Palermo barrio (neighbourhood). Usually held in February, it includes both a men's singles and a men's doubles tournament. Between 1970 and 1989 it was part of the Grand Prix tennis circuit and a Grand Prix Super Series event (1970–71). The Autódromo de Buenos Aires Juan y Oscar Gálvez (official name) is a 45,000 capacity motor racing circuit in Buenos Aires, Argentina built in 1952 under president Juan Perón, named Autódromo 17 de Octubre after the date of Loyalty Day until Perón's overthrow. It was later renamed after Argentinian racing driver brothers, Juan Gálvez and Oscar Alfredo Gálvez. The Buenos Aires Underground (Spanish: Subterráneo de Buenos Aires), locally known as Subte (Spanish pronunciation: [ˈsuβte], from subterráneo – 'underground' or 'subterranean'), is a rapid transit system that serves the area of the city of Buenos Aires, Argentina. The first section of this network (Plaza de Mayo-Plaza Miserere) opened in 1913, making it the 13th subway in the world, and first underground railway in Latin America, the Southern Hemisphere and the Spanish-speaking world, with the Madrid Metro opening five years later, in 1919. As of 2015, Buenos Aires is the only Argentine city with a metro system, but there is a proposal to build a metro in the city of Córdoba (the Córdoba Metro), while a proposal to build a metro in Rosario was shelved in favour of a tramway network.Currently, the underground network's six lines—A, B, C, D, E, and H—comprise 54.9 kilometers (34.1 mi) of route that serve 87 stations. The network is complemented by the 7.4 km (4.6 mi) long Premetro line, and the 26 km (16 mi) long Urquiza suburban line, with 17 more stations in total. Traffic on lines moves on the left, because at the moment of system's open Argentina drove on the left. As of 2015, the underground also has 4 closed stations, and lines E and H are undergoing expansions. Over a million passengers use the network, which also provides connections with the city's extensive commuter rail and bus rapid transport networks. The network expanded rapidly during the early decades of the 20th century; by 1944 its main routes were completed, with the addition of its newest line occurring as late as 2007. The pace of expansion fell sharply after the Second World War. In the late 1990s expansion resumed at a quicker pace, and four new lines were planned for the network. Despite this, the network's expansion has been largely exceeded by the transportation needs of the city and is said to be overcrowded. As of 2015, two modernisation plans have been presented: City of Buenos Aires law 670, proposing the creation of 3 new lines, F, G and I; and the PETERS plan, wherein 2 lines are created and the I line is postponed for future expansion, plus several other route amendments. The entire network was nationalised in 1939, remaining in state hands and operation until the mid-1990s when it entered into a concession model. The previously state-operated lines were offered as 20-year concessions to interested private parties; the two complementary lines were also included in this privatisation and all have been operated by Metrovías since 1995, though the network and rolling stock remain the property of the City of Buenos Aires. Estadio Luna Park (commonly known as Luna Park) is a multi-purpose arena located in the heart of Buenos Aires. Located at the corner of Avenida Corrientes and Avenida Bouchard; in the San Nicolás neighborhood. Initially, the arena primarily hosted boxing and other sporting events. In the 1950s, it was expanded to host stage shows and concerts. The stadium has hosted countless internationally famous personalities, including Pope John Paul II, several ballets, tennis and volleyball matches, world championship and important non-championship boxing fights involving Nicolino Locche, Hugo Corro, Santos Laciar, Carlos Monzón, Omar Narvaez, Juan Roldán, Julio César Vásquez and many other famous boxers, circuses, the Harlem Globetrotters, Holiday on Ice and many more. The arena also hosted the 1950 FIBA World Championship, the final phase of the 1990 Basketball World Championship and the 1976 Basketball Intercontinental Cup in which Real Madrid won the competition.The arena also hosted the Six Days of Buenos Aires cycle race. Greater Buenos Aires (Spanish: Gran Buenos Aires, GBA), Buenos Aires Metropolitan Area or Buenos Aires Metropolitan Region refers to the urban agglomeration comprising the autonomous city of Buenos Aires and the adjacent 24 partidos (districts) in the Province of Buenos Aires. Thus, it does not constitute a single administrative unit. The conurbation spreads south, west and north of Buenos Aires city. To the east, the River Plate serves as a natural boundary. Urban sprawl, especially between 1945 and 1980, created a vast conurbation of 9,910,282 inhabitants in the 24 conurbated partidos, as of 2010, and a total of 12,801,365 including the City of Buenos Aires, a third of the total population of Argentina and generating more than half of the country's GDP. This is a list of cities in Argentina. For a more extensive list of cities in a particular province, see the main article, linked to in each applicable section. Ministro Pistarini International Airport (Spanish: Aeropuerto Internacional Ministro Pistarini) (IATA: EZE, ICAO: SAEZ), known as Ezeiza International Airport owing to its location in the Ezeiza Partido in Greater Buenos Aires, is an international airport 22 kilometres (14 mi) south-southwest of the Autonomous City of Buenos Aires, the capital city of Argentina. It is the country's largest international airport by number of passengers handled—85% of international traffic—and is a hub for international flights of Aerolíneas Argentinas and LATAM Argentina. Aerolíneas Argentinas and its subsidiary Austral Líneas Aereas do operate limited domestic or cabotaje air service from Pistarini Airport as well. Covering 3,475 hectares (13.42 sq mi; 8,590 acres), the airport serves Buenos Aires and its metropolitan area. It has been operated by Aeropuertos Argentina 2000 S.A. since 1998. It is one of three airports serving Buenos Aires, along with Aeroparque Jorge Newbery and El Palomar Airport. The Premetro is a 7.4-kilometer long (4.6 mi) light rail line that runs in the outskirts of Buenos Aires, connecting with the Buenos Aires Underground line E, at Plaza de los Virreyes station and runs to General Savio, with a short branch to Centro Cívico. It opened in 1987 and is operated by Metrovías. Originally, the Premetro was to include many more lines, but shortly after the privatisation of the railways the projects were postponed and never materialised and only "Premetro E2" was built. Argentina is subdivided into twenty-three provinces (Spanish: provincias, singular provincia) and one autonomous city (ciudad autónoma), Buenos Aires, which is the federal capital of the nation (Spanish: Capital Federal) as decided by Congress. The provinces and the capital have their own constitutions, but exist under a federal system. Quilmes (Spanish pronunciation: [ˈkilmes]) is a city in the province of Buenos Aires, Argentina, on the coast of the Rio de la Plata on the south east of the Greater Buenos Aires. It is the seat of the eponymous county, and has a population of 230,810. 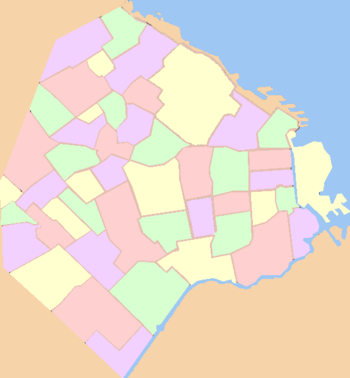 It is located 17 km (11 mi) south of the capital of Argentina, the Autonomous City of Buenos Aires. The Teatro Colón (Spanish: Columbus Theatre) is the main opera house in Buenos Aires, Argentina. It is considered one of the ten best opera houses in the world by National Geographic, and is acoustically considered to be amongst the five best concert venues in the world.The present Colón replaced an original theatre which opened in 1857. Towards the end of the century it became clear that a new theatre was needed and, after a 20-year process, the present theatre opened on 25 May 1908, with Giuseppe Verdi's Aïda. After this period of huge international success, the theatre's decline became clear and plans were made for massive renovations. After an initial start of works to restore the landmark in 2005, the theatre was closed for refurbishment from October 2006 to May 2010. It re-opened on 24 May 2010, with a programme for the 2010 season. The University of Buenos Aires (Spanish: Universidad de Buenos Aires, UBA) is the largest university in Argentina and the largest university by enrollment in Latin America. Founded on August 12, 1821 in the city of Buenos Aires, it consists of 13 departments, 6 hospitals, 10 museums and is linked to 4 high schools: Colegio Nacional de Buenos Aires, Escuela Superior de Comercio Carlos Pellegrini, Instituto Libre de Segunda Enseñanza and Escuela de Educación Técnica Profesional en Producción Agropecuaria y Agroalimentaria. The university has produced four Nobel Prize laureates, one of the most prolific institutions in the Spanish-speaking world. According to the QS World University Rankings (2017/18) the University of Buenos Aires ranked number 75 in the world, making it the highest ranked university in Ibero-America.